You know, readers, it was not that long ago that I had no idea who Cap was. My first taste of Marvel stories were TV shows about the X-Men and/or Spider-Man. 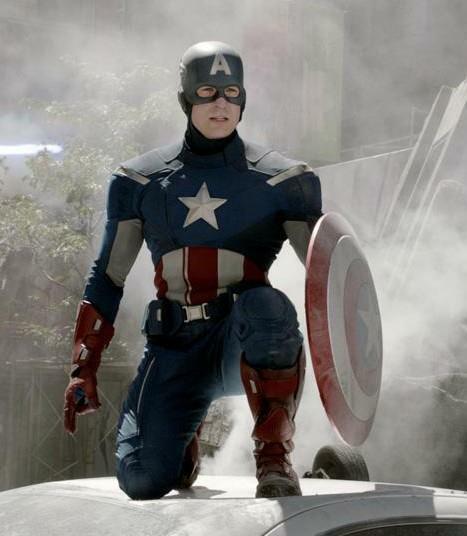 Cap showed up very rarely in either set of storylines, so his adventures and character were never really explored. After all, in a TV series about the X-Men or Spider-Man, the show is going to revolve around them and their particular friends, enemies, and problems. There is not much room in such a story for guys like Cap (let alone all the other Avengers). Then the first Iron Man film hit theaters. I did not pay much attention to it at the time beyond learning that Iron Man was not the robot I had thought he was for years. (Like Cap, he never got much screen time in X-Men/Spider-Man TV series. And when he did show up, he always wore his armor. Secret Identities were all the rage back in the 1990s, unlike today.) I heard about Iron Man 2, which the media were crowing about after it hit theaters, but I somehow missed out on all the hype over Thor and Captain America: The First Avenger. Then I heard about The Avengers. By this point, I had begun researching some old comics I had picked up. Most of them were X-Men comics, with a couple (literally) of Spider-Man stories. These were old news to me, in a way, but the few comics I had with the Avengers in them were hard to understand. I knew who Scarlet Witch and Quicksilver were (thank-you, X-Men TV series), but Hawkeye was an unknown and Cap I knew only slightly. He was from World War II, and that was all I could tell you about him. So I did the only thing a curious person could do. I started looking up these Avengers. One of the first I looked up was Captain America – and it was not long before I discovered that Cap was a character I could support on practically everything. It is hard to describe Cap. This is not because, as his numerous critics like to say, he has a character as colorless as plain glass. I suppose part of what makes Steve Rogers/Captain America so hard to discuss in terms of personality is the fact that he consistently makes the right choice, all the time, every day. And he does it in such a way that readers/viewers are always aware of how he makes his decisions. No matter the situation, no matter the danger, no matter the temptation to take the “easy way” out of a crisis, Steve does not swerve from his moral compass. “This is right, this is wrong,” he says. In this writer’s opinion, no other character in modern literature – with the exception of J. R. R. Tolkien’s Aragorn from The Lord of the Rings trilogy – has been written in this way. At some point, every other hero has weakened, made a compromise with his moral compass, or taken a nosedive over a moral cliff, only to claw his way back up to “hero status.” Superman may come close to Cap’s record, but I stopped paying attention to him a few years ago, so I cannot comment on him very well. This is why so many people love Captain America. And this is why so many other people hate him. This is shown when they call him a “Boy Scout,” “old-fashioned,” or – my personal favorite – “idealistic.” On top of this Cap is the embodiment of everything that makes the U.S. great. He defends the weak, fights for truth, justice, freedom, and he never gives up. It may sound clichéd and dry, readers, but it is true. There are people who still will tell you that Cap is “not so great.” That he “hardly has any personality,” or that people only notice him “because [he] wears a flag on [his] chest and thinks [he] fights a battle of nations!” Even Chris Evans, the man who portrays Cap in Marvel’s wildly popular Avengers’ themed films, downplays Steve Rogers as a “dry” personality. What is so interesting about Cap? Yes, the United States has problems, which I am as aware of as anyone else who lives here. Yes, we have made mistakes, and a number of them have been blatant, horrible lapses in our public consciousness of right and wrong. Looking at this resume of faults, I feel close to tears, and I was not even alive for most of these events. That does not mean that I feel those national mistakes any less keenly than if I had lived through them all, and I can believe that a lot of people hate us for them. And I know that Cap feels the weight of America’s mistakes, too: “When I went under, the world was at war. I wake up, they say we won. They didn’t say what we lost.” He saw the America he loved united and fighting for the survival of the world, not just for its own survival, when he went into the ice. Then he wakes up seventy or more years later to an America that is self-obsessed, petulant, despairing, fractured, and under attack. But he does not throw in the towel on his country, like a lot of people today want to do. He puts on his uniform and goes out to do what he did back in the Great War: he fights for the values his country was founded on, he fights for his people, and he fights to make sure the world can survive so that it can go on forging its destiny. That last part is the hardest battle because, after defeating threats from space, Cap still has to deal with the haters, tyrants, and other evil people who live here on good old terra firma. Although the U.S. has made mistakes and is in trouble, and seemingly going through the “terrible teens,” Cap does not give up on it. He does not give up on the hope that the country he loves will turn itself around. Which brings me to the other thing about Captain America that people love and people hate: he never gives up hope. No matter the grimness of the situation, no matter how hard and hopeless the battle becomes, Cap still hopes that everything will turn out all right – even if he and his teammates may not live to see it. In this way, Cap also resembles Aragorn. Growing up, Aragorn lived in Rivendell under Elrond and his people’s care. In Imladris – Rivendell – his true heritage, his real name, were completely hidden from him. Elrond, instead of calling him Aragorn, named him Estel in his youth. In Elvish, Estel means “hope.” And throughout his long years battling orcs, men, and Sauron, Aragorn never lost hope that the evil in Mordor could be defeated. The appendix to The Return of the King, which tells his and Arwen’s story, says that hope was “like a spring” inside him, and laughter and mirth would bubble up at the most unexpected times, startling his friends and enemies alike. These are the reasons why I think Cap is the greatest Marvel hero, and these are the reasons why he is one of my favorite Marvel characters. He is all-American, always good, always makes the right decision, all the time. And he never, EVER quits – or gives up hope. If I had to face all the evil that Cap directly battles before sitting down to breakfast, I would probably quit. When looking out over the U.S. in its current state, I do feel like giving up. What in the world am I going to do to make a difference? I am one small person, with one small voice, that nearly no one can hear. What good can I do? And he would be right to tell me that. If Cap was a real man, and if I was someone who could follow him into a fight, I would. He is the kind of leader I wish we had. And I know I am not the only one who wishes he was a real man. If I were, then the Avengers’ and the Captain America movies would not be nearly as popular as they are. This entry was posted in Marvel Comics' Characters and Stories, Spotlight! and tagged America, Avengers, Captain America, Captain America/Steve Rogers, Chris Evans, hope, leaders, leadership, Marvel Cinematic Universe, Marvel Comics, Marvel Comics' Characters and Stories, Marvel films, Napoleon, no quit, Spider-Man, Spotlight!, United States of America, X-Men on June 26, 2015 by The Mithril Guardian.